I’ve never lived on a farm before. But living on a farm? I take it that it’s a completely different experience altogether. And from what I could gather on a subject – sometimes it can feel as though you’re living on a completely different planet – in a good way. 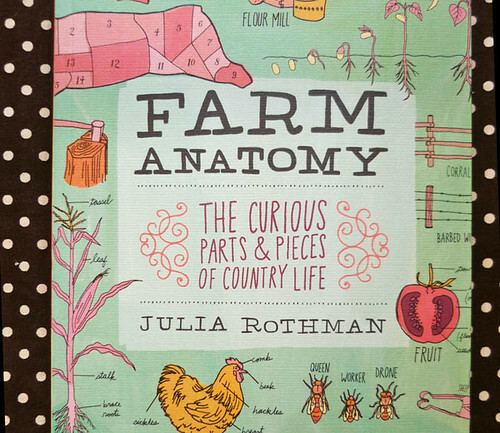 So when Julia’s book Farm Anatomy came out, I was thrilled. 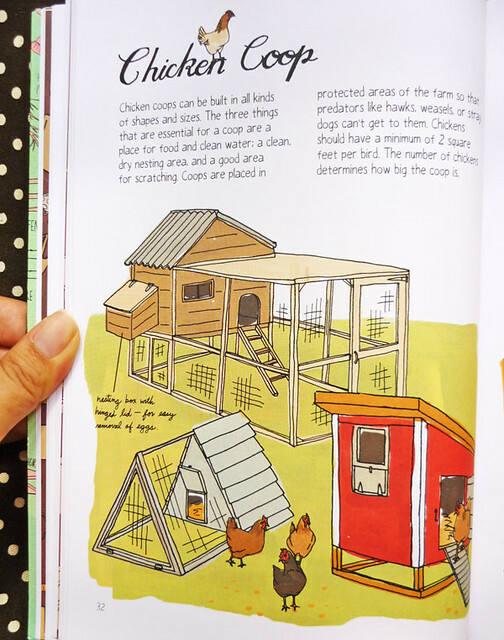 Not only was it going to be about life on a farm (imagine – a manual for those who has never lived on a farm, let alone visited one! ), but it was to be 100% illustrated entirely by her. That last thought alone almost made me break out in hives of excitement. First off: The book is gorgeous. The paper quality is beautiful, which serves to really bring out the illustrations that Julia has done. 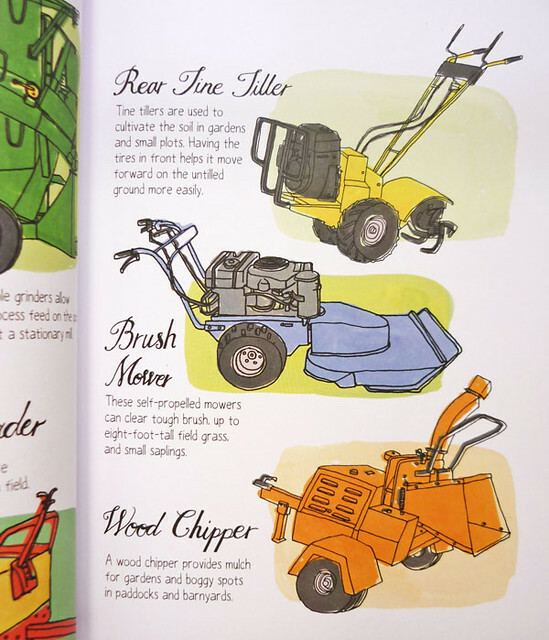 I can’t stress how important paper (glossy vs. matte, textured vs. smooth, etc) is in effecting how your illustrations will turn out, and the team at Storey Publishing has managed to do a wonderful job. Julia’s style is all over the book. And when I say Julia’s style – I mean that you know that it’s her when you flip through it. 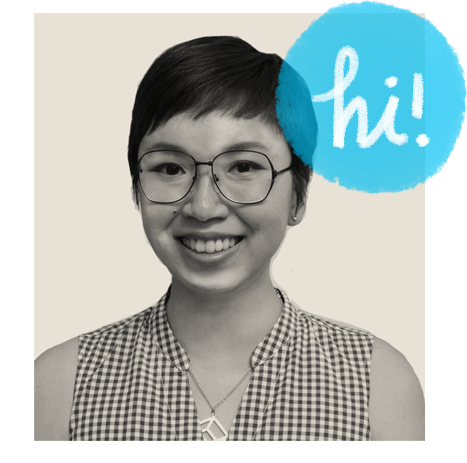 Her hand-drawn type; the crisp, clean perfectly imperfect lines that has been the hallmark of her work since the very beginning; and the details that accompany each and every one of them. You see it repeated time and again in her patterns and in her illustration work; and needless to say, if you’re a big fan then this book is a must have. 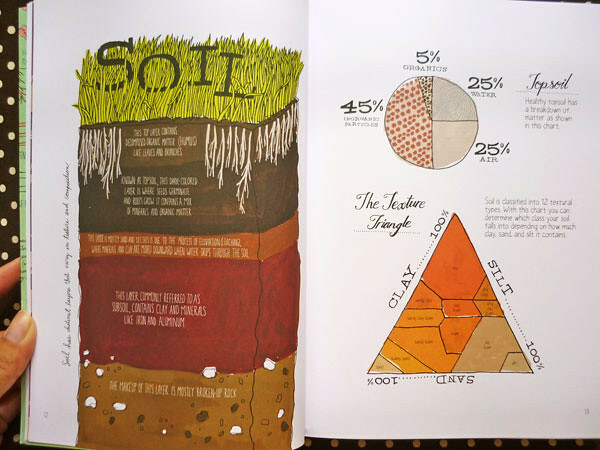 The meat of the book is in the information as well; offering nuggets of information and an informal roadmap into the workings of a farm. Gleaned through years of experience during her time at her husband’s family farm, Julia has come up with an easy-to-read book that has information that I never thought of knowing. Things like milking a cow, or the various different tools that farmers used, and even how a barn is constructed (handy if you ever have the urge to build one). Or what about a rooster’s comb? Did you know that there were THAT many different types? If I’m at a dinner party (where the people are predominantly city folks), I’ll know that information would come useful – random as it may be! 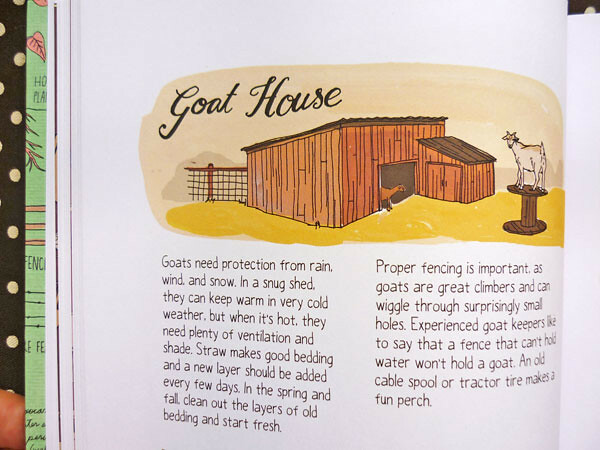 More than just a book for adults, I could see how the book would make a fun farm encyclopedia for kids as well. Unfortunately for them, I’m putting this book on a high shelf for when little people come to visit, that’s for sure. Or maybe I’ll just get them one for Christmas. I’ll see. 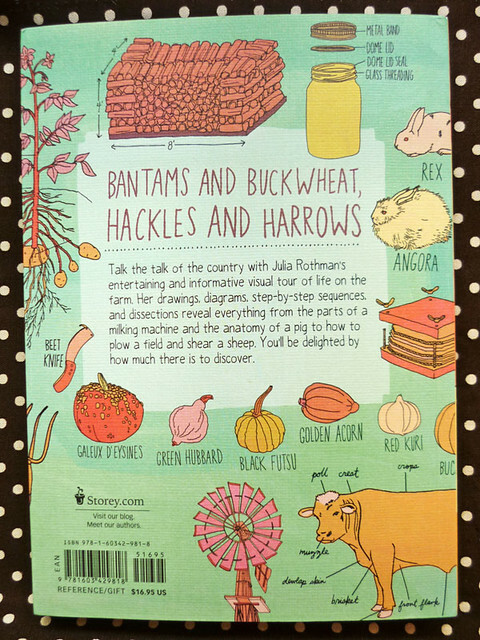 You can get a copy of Julia’s Farm Anatomy: The Curious Parts and Pieces of Country Life over at Amazon. I’ll catch you back here on Monday with more illustration goodness! 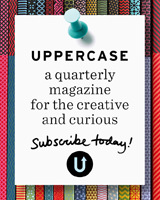 Oh, and just in case, have you signed up for our free and awesome mailing list yet? There is so much to learn about farm life! We just moved out to rural Iowa this year (from Seattle), and are having quite the adventure of it. This book is going to be our new bible! I love this! I’ve dreamed of writing (ie drawing) something like this myself. I might have to get a copy of my own. Thanks for sharing. I have been following Julia’s blog and have been looking forward to her online tour. 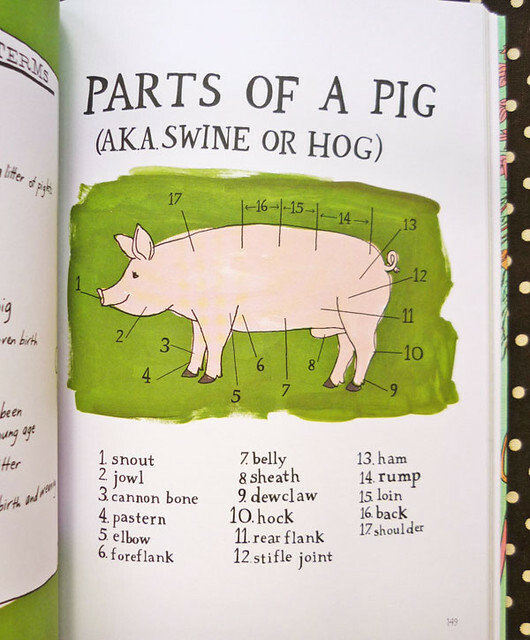 I am so glad that you featured Farm Anatomy! I just put it on my XmasList yesterday and can’t wait to get it. Great post. That looks like a really fun, inspiring book! Thanks for the giveaway. Love it! What a great book.